If you want to diversify the home environment, it's interesting to decorate the child's room and create something truly original, hand-made articles made by wire will help to solve these problems. This kind of rolled metal can become a universal material for manufacturing Interior items, Toys, souvenirs and ornaments. The convenience of working with this material is that it is able to take any form and at the same time reliably hold it. Original handicrafts on which beginners are trained and children learn to develop their artistic skills. Several millennia ago this materialWas obtained by cutting metal sheets into narrow strips. To get rid of sharp edges, the strips were twisted in a special way or rolled between flat surfaces. Modern methods of making wireAre reduced to the method of drawing. This technique consists in pulling metal rods through conical holes. In this way they were used in Persia in the 6th century BC. E. However, the territory of Central Europe, the method of processing metal came in the X century. E. It is from this period that the industrial production of wire begins. The most widespread among the craftsmen engaged in repairing shoes, equipment and baskets. The use of a steel analogue became widespread. He wove chain mail, produced brushes for combing the wool, used in the manufacture of horse harness and chains, fishing tackle and sewing accessories - needles. 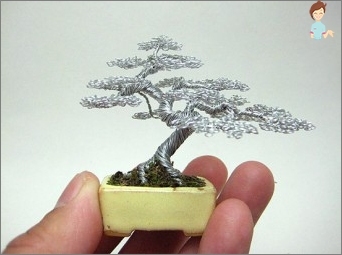 At the same time, the method of drawing was mastered and to create a wire made of precious metals. In the Middle Ages, flexible delays, similar toThreads made of gold and silver were used by needlewomen of France and England for rich embroidery. This lasted until the middle of the XVI century. Gradually, the popularity of art has declined. And not everyone could afford to engage in such a craft or hobby. The wire was also made of iron. For a long time, metal was not held in high esteem because of its propensity for corrosion, but at the end of the 18th century people still learned to protect such products from rust by tinning and processing with black lacquer. In America (first North) the wire came fromEngland and Germany. But in 1812, when, as a result of a military conflict with Britain, supplies ceased, the Americans began to develop their own production and build up dockyards. By the middle of the XIX century, thanks to the appearance of the steam engine at full capacity, mass production of wire, fences and netting from it was launched. 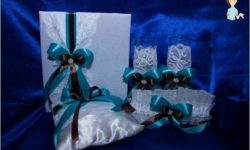 The material became available, and since thenMass production by craftsmen of the most diverse products - from the simplest desktop accessories, jewelry and furniture. The tradition of working with this material has stopped with the advent of plastic. But today he is experiencing a second birth. With fashion for an eco-conscious way of life, peopleBegan to recall the simple ways to make excellent things without expensive technology. And today we learn about more and more original methods of creating beautiful and unusual, piece, rather than stamped on the conveyor interior items. 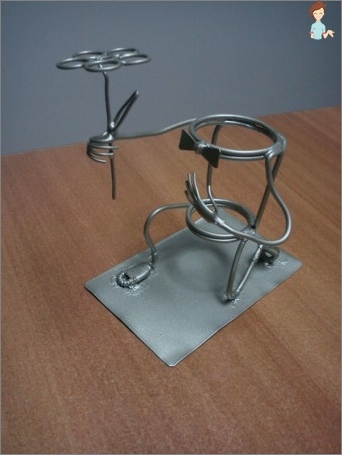 Among the whole variety of work with wire, three main methods are distinguished. 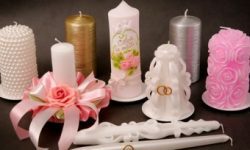 Ganutel - the art of creating flowers for decoration andStylish accessories (usually wedding) of fine spiral wire and thread of silk. Such crafts from wire are decorated with beads, beads and pearls. Before you buy a wire suitable for your crafts, find out about some of the features of its types. Brass. The most popular material for creating beautiful jewelry. From this species, excellent brooches and hairpins are obtained. The material does not fade. Therefore, it is appreciated by craftsmen. This metal practically does not cause allergies. But keep in mind that sometimes it can contain a small amount of lead - a heavy metal, harmful to health. Copper. Its best application is the creation of "Tree of life", Bonsai and other plant objects, includingNumber of colors from beads. It's very easy to work with this variety. It is recommended to begin with it when your child shows interest in this fascinating form of creativity. Silver. With its help, you can create jewelry premium segment. In the frame of such a wire, a variety of semiprecious large stones - malachite, obsidian, amethyst and others - look very stylish. You can create a magnificent gift - a luxurious picture. Use this wire, finished patterns and beads. Chenille or overcoat - so called fluffyWire, which is still little known on our vast spaces. This covered with a plush cloth "caterpillar", very much it is pleasant to children. From such shaggy material it is good to make figures, letters and other interesting things. And the whole process will be full of joy and fun. It perfectly bends and is well cut with scissors. Products from it perfectly keep the form. Most of all children like to create from the chenilleChristmas toys and snowflakes, bouquets, funny little animals and a lot of other things. A non-standard way of using the girls found. They weave the wire into the hair, creating thus amazing hairstyles, similar to crowns. Problems with where to find simple and not verySchemes for creating crafts for crafts of any objects from the wire, should not be. The possibilities of the World Wide Web are simply limitless. And you can easily get simple schemes with step-by-step instructions, freely available or buy author's drawings, as well as watch a thematic video. Fix the image or appearance of the product you want to create, not only in your thoughts, but also on a piece of paper. Even the simplest "Angel"Or a house for a children's room needs drawing a drawing or drawing. It will be much easier for you to work, seeing an approximate result. Observe safety measures. 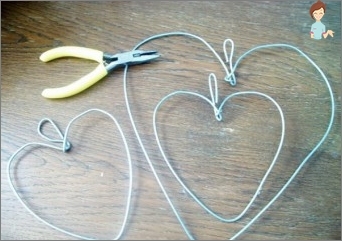 In this work, cutting objects (wire cutters) are used, and the wire itself is pricked. Therefore, children of younger age, no older than 5 years, are not recommended to engage in such crafts. 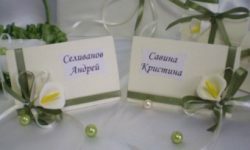 Do not buy material in constructionSupermarkets, if you are going to create jewelry. For needlewomen, special wire is produced, easy to use and safe from the point of view of origin of raw materials for it. These recommendations will make your work a pleasant experience, capable of bringing a lot of positive emotions.